The 2019 Edelman Trust Barometer reveals that trust has changed profoundly in the past year—people have shifted their trust to the relationships within their control, most notably their employers. Globally, 75% of people trust “my employer” to do what is right, significantly more than NGOs (57%), business (56%) and media (47%). This study always fascinates me because social advocacy stems from a place of trust. Unless your employees (and customers for that matter) are emotionally connected to your brand and share similar values to that of your business, advocacy is going to be an uphill struggle. What's interesting is that employer trust isn't something localised to specific countries. 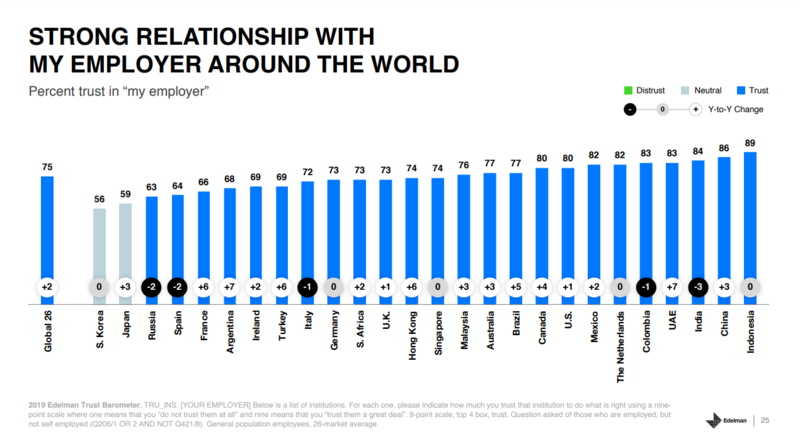 As the chart below shows, employees have a strong relationship with their employer around the world. This relationship is stronger than any other including NGOs, politicians (not surprising), businesses, government and media. This emphasis on trust isn't just about the employer. When you look to who people rate as very/extremely credible sources of information, it's clearly time to activate the employee voice. Technical experts, people like yourself and regular employees consistently sit in the top spots (with the biggest rise in 2019 coming from "A person like yourself"). 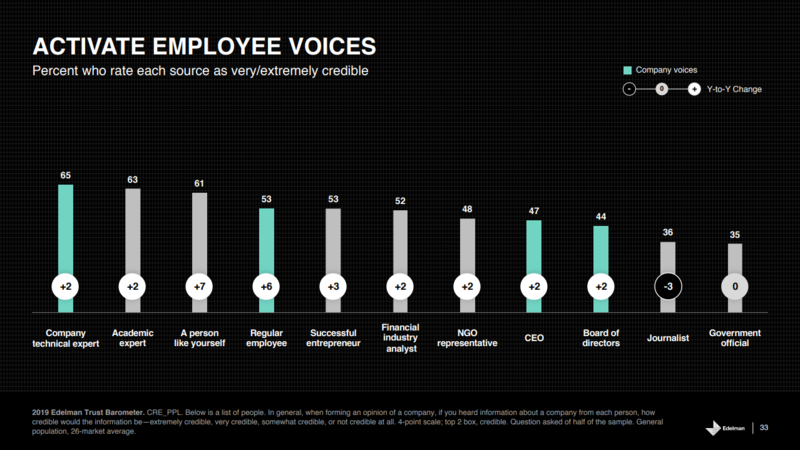 The key message to take from this latest research is that employees have the power to be your authentic brand voice. 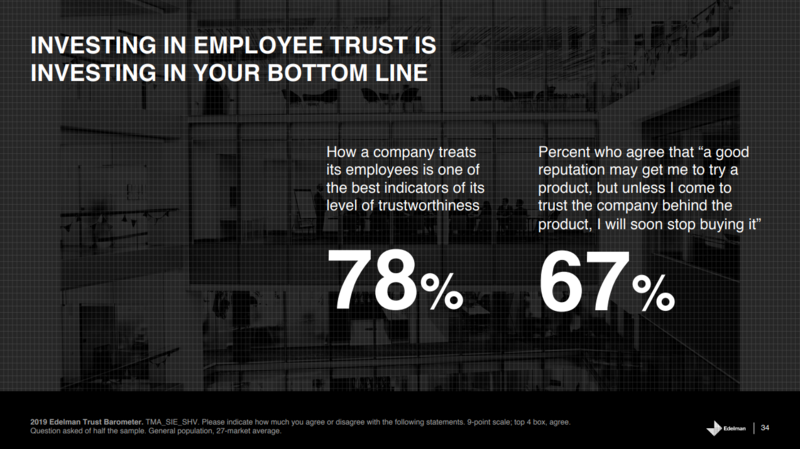 Peers, customers and your future employees trust them. Smart organisations are recognising this and encouraging employees to actively participate in social media conversations. However, this won't come naturally for many employees. Until now, the relationship between employer and employee has been largely contractual. Employer needs resource. Employer hires employee to work for an agreed salary and under contract. This contractual relationship has typically been employer led and on the employers terms. But this is changing. Employers have recognised the incredible advantage of having an engaged workforce which includes increased productivity, innovation, improved customer experience, stronger loyalty and ultimately advocacy. 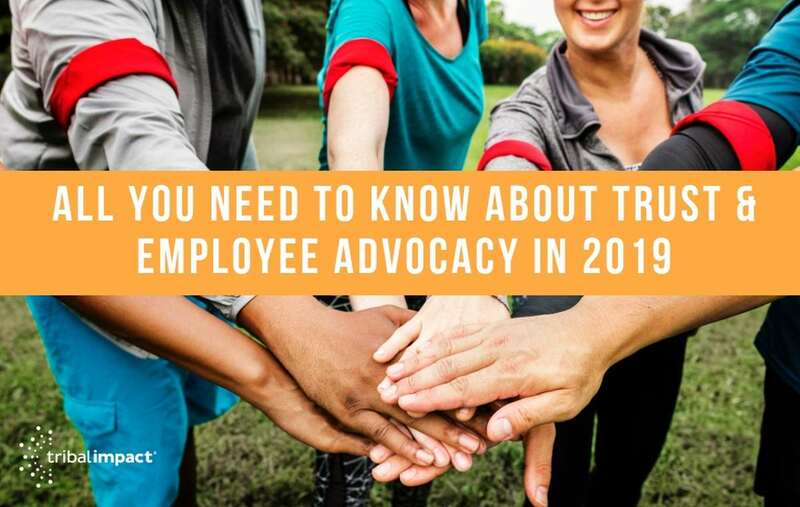 Advocacy is when you don't just earn your employees time and commitment - you earn their trust and dedication. To the point they are proud to represent who they work for. 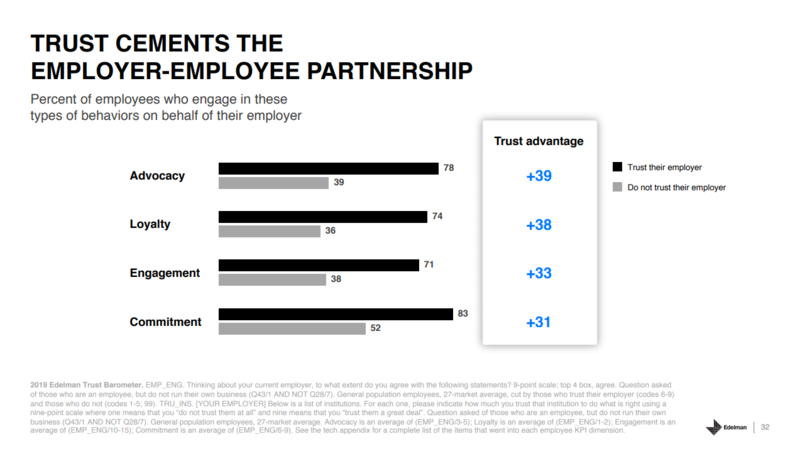 The 2019 study has shown that trust between employee and employer is at its highest. Put simply, there's never been a better time to tap into the engaged workforce and elevate this trust into advocacy. The new employer-employee contract goes beyond the process of hiring people. In my opinion it happens way before that moment. It's about creating an environment where the logo steps back and the employees are positioned front and center. Where the company attracts best-fit talent in the way it operates. Digitally up-skill your workforce and invest in their future. Create a culture that is visionary and inspirational by giving your employees the freedom to innovate. Enable employees to have a voice. Help them understand the importance, for them and your company, why their expertise and role is important to business growth. Build relationships locally and demonstrate that your brand cares by donating time and resources to improve societal conditions in the communities in which you operate. Embed your values in everything you do - when selecting the customers you work with, the talent you on-board and the way you operate from the reception desk to the board room. Be what you say you are and this starts at the top. Many board rooms may look at this study and consider it the responsibility of HR to execute and the role for internal communications to facilitate. What we're talking about here isn't a job to be assigned or a task to be delivered. This will impact your bottom line and needs to be considered a cross-company priority. 78% of people agree that how a company treats its employees is one of the best indicators of its level or trustworthiness. 67% agree that "a good reputation may get me to try a product, but unless I come to trust the company behind the product, I will soon stop buying it". When you understand the connection between trust, employee engagement and advocacy you will understand the complexity that operates behind trusted brands such as Virgin. Those brands that have access to the secret sauce of success. The sauce that oozes out of employees who greet you with a Cheshire Cat grin that says "I love my job" without saying it. Those brands that have invested (and continue to invest) in well-being, happiness and development and their employee community (note I didn't say workforce!). Those brands that have employees who go above and beyond their job description not because they were asked but because they want to see the company grow. Welcome to 2019. Welcome to the trust economy.